The Rebel Genius is dedicated to shaking you out of your comfort zone and focusing on what makes you, as a unique individual, a genius in your own right. It's time to realize your potential and embrace your destiny for happiness and success in life. Why? Because YOU are a genius and, like most people, you're wasting that genius by selling yourself short. 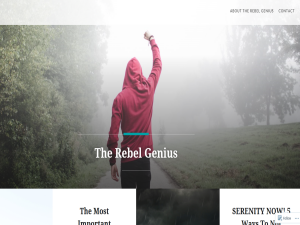 This what your The Rebel Genius Blog Ad will look like to visitors! Of course you will want to use keywords and ad targeting to get the most out of your ad campaign! So purchase an ad space today before there all gone! If you are the owner of The Rebel Genius, or someone who enjoys this blog why not upgrade it to a Featured Listing or Permanent Listing?